In what has become a TED Talk classic, Bryan Stevenson, founder and executive director of the Equal Justice Initiative, observes: “the opposite of poverty is not wealth…the opposite of poverty is justice.” Stevenson’s point is that it is not the lack of wealth that impoverishes people, but the complex of factors that lead people who do not have wealth to be treated unequally, and often victimized. Some of us in the conservation community have experienced working in places characterized by a remarkable absence of both wealth and want, and the pleasure of knowing indigenous and traditional peoples who shared a positive and hopeful view of the world and their place in it. They did not experience the absence of what we considered wealth as want, and their identity was tied to their active stewardship of the natural ecosystems that characterize the places they lived, and on which they depend. We have also witnessed the destruction of these places through encroachment and appropriation of land and resources by mines, farms, ranches, plantations, oil fields, roads and dams. While we see this loss through the eyes of conservation, it has also been clear that transformation of land, biodiversity, and ecosystem functions often begins with their appropriation from people for whom they historically have been sources of livelihood and identity. This loss deprives indigenous and traditional peoples not only of livelihoods but of their access to experiences that made their lives rich and meaningful. Instead, they face uncertainty about what will become of their children; indifference and disrespect because they lack the skills and power to engage the actors and institutions assaulting their quality of life; and alienation as the knowledge, values and experience that once signified wisdom and respect are deemed irrelevant. Dispossessed of a stake in the future of a place that has been their home, they are progressively reduced from being front-line stewards of land, wildlife and other resources to using what they can, while they can. Indeed, for these peoples, the essence of poverty is powerlessness in the face of a loss of land and resources that have been their shared property and which defined their relationships to one another and the places they called home. This loss is often justified in national and international debates by reference to social and economic benefits that accrue to others. I would argue that, in fact, humanity becomes poorer and less secure. We are, of course, poorer in a figurative sense when we allow others to be denied the wherewithal to live with dignity. We are also poorer in a more literal sense. By accepting the destruction of biodiversity, the degradation of natural ecosystems and the release of large quantities of carbon dioxide and methane into the atmosphere, we undermine the security of our own existence. Conservationists and rights advocates have long recognized that degradation and appropriation of biodiversity and natural ecosystems are intertwined with impoverishment of indigenous and traditional peoples. However, our efforts to join forces have been fitful. We have not effectively challenged the view, promoted by well-funded and politically powerful interests, that these are unfortunate but inevitable consequences of development that, someday, will benefit everyone. Our two communities share responsibility for this failure. Conservationists have worked valiantly, and often effectively, to conserve biodiversity, prevent ecosystem degradation, and find ways to mitigate, and adapt to, the threat of climate change. This has often involved marshaling the knowledge, resources and political will required to empower people to act as effective stewards of land and resources. Yet, there are also numerous examples of indifference to the injustice of appropriation, and even collusion in it, in exchange for the promise of funding and political support for conservation. 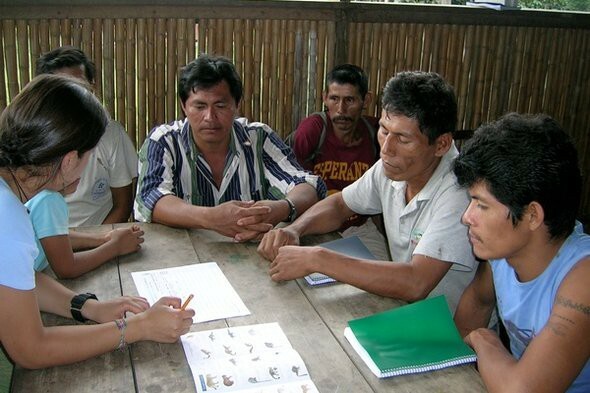 For their part, many rights advocates provided critical support to successful efforts by indigenous and traditional peoples to win recognition of land and resource rights. Unfortunately, development has often changed social and economic conditions, and depleted available resource endowments to such an extent that aspirations to build better lives based on the exercise of newly recognized rights are thwarted. Too rarely have rights advocates remained engaged with the peoples whose struggles they have supported to address the resource management challenges presented by a changed context. The appropriation and degradation of biodiversity and natural ecosystems is a double injustice, impoverishing the indigenous and traditional peoples who depend on them for sustenance and identity, and contributing to insecurity of human life more generally. Effective conservation requires that we address both injustices, and addressing both requires that the conservation and rights communities work together to a greater degree than we have managed thus far. Successful struggles to win recognition of rights need to be followed by land and resource use decisions that contribute to realizing aspirations for a better life. That is the right thing to do, and the rest of us have an interest in their success, because our own prospects for living with dignity improve to the degree that indigenous and traditional peoples defend and reclaim their roles as effective stewards of land, wildlife and natural resources. Michael Painter is a senior technical advisor at WCS (Wildlife Conservation Society). This story was originally published at blogs.scientificamerican.com on April 18, 2017.